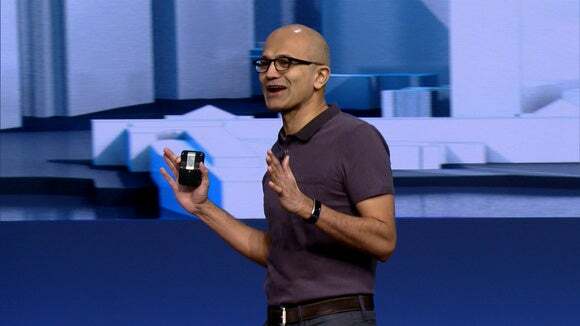 Microsoft CEO Satya Nadella is pushing developers to create virtual assistants and intelligent chatbots to help users do everything from managing their calendars to booking hotel reservations. To that end, Microsoft has published a new Bot Framework, which makes it easier to build chatbots using either C# or Node.js. Working with the tools isn't so easy that anyone could do it, but they can help reduce some of the difficulties of conversing with a computer. It was one of the main announcements from Nadella's keynote address at Microsoft's Build developer conference Wednesday. In a session following the keynote, Microsoft Senior Research Development Engineer Dan Driscoll revealed an interesting point in favor of creating intelligent bots as an interface for a service: The bots let developers meet users where they are without having to worry about what platform those people are on. That's particularly notable for Microsoft because it's not doing well in the mobile phone market. As more computing goes mobile, and moves toward iOS and Android, the company needs a way to stay relevant and involved in users' lives on their smartphones. If Microsoft can be one of the companies to power a new generation of intelligent bots, it could get developers locked into its cloud services, and stay even more involved with what could be the future of computing. Derrick Connell, the corporate vice president of Bing, said he foresees a future in which there are tons of bots for different applications. In his view, businesses will want bots representing them to give them access to customers who are discussing decisions they're about to make. After all, there's no better time to advertise hotel reservations than when people are first thinking about booking a room. Looking toward the future, computer users may face an interesting conundrum, where there will be too many bots to handle the same query. After all, if someone is discussing a trip to San Francisco, there could be two dozen hotel bots, 10 airline bots, and 80 restaurant bots all vying for that person's attention. That's when users will have to rely on intelligent systems moderating these bots to point them to ones that specifically meet their preferences. If Microsoft can be at the forefront of that with Cortana, it could be in a valuable position. The counterexample to an intelligent assistant brokering the right bot transaction is the current state of online advertising. Theoretically, advertisements should be relevant to users as they're browsing the Web, but that's rarely what happens. Right now, we're still at the beginning of what could be a nascent bot revolution. What remains to be seen is whether they will actually catch on.